Breast fibroadenoma treatment varies in different ways once the diagnosis is done. If it is small and remains the same for long then there is no need for treatment but follow up with regular ultrasound is recommended. As benign growths, breast fibroadenomas are not always removed from the breast. Instead, the mass is left and carefully monitored for changes in shape and size. 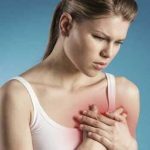 Whether breast fibroadenoma is removed depends on a number of physical and psychological factors. If tumor size or location causes pain or discomfort, then the fibroadenoma could be removed. If breast fibroadenoma is large (more than 3 cm) with pain and cells are seen in the biopsy then excision or surgical removal of fibroadenoma is the choice of treatment. Over 40 years of age, it is advised to get surgical removal. Patient concerns and anxieties are also factors. If a woman is uneasy with the idea of a breast mass remaining untreated, the breast fibroadenoma may be removed to alleviate her anxiety. A fibroadenoma may be removed under local anesthetic, either through surgery or through the use of a fine needle. If a biopsy is required to rule out malignancy, the entire fibroadenoma may be removed during the procedure. Breast fibroadenoma recurrence rate is high even after removal. The outlook is excellent, although patients with breast fibroadenoma have a slightly higher risk of breast cancer later in life. Lumps that are not removed should be checked regularly by physical exams and imaging tests, following the doctor’s recommendations. Complications from fibroadenomas are not uncommon. Biopsies and fibroadenoma removal, like all surgical procedures, carry the risk of bleeding, scarring, and post-operative infection. After the breast fibroadenoma is removed, it is not unusual for a new fibroadenoma to grow in the same location. In most cases the fibroadenoma (lump) is left in place and carefully watched; it could need to be removed at a later time if it changes, grows, or doesn’t go away. You have changes in the breast that are not affected by the menstrual cycle. Perform regular breast self-exams and undergo breast screening as recommended by your health care provider. 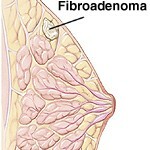 Check breast fibroadenoma causes, symptoms and diagnosis on next page.